When there are so many recordings of Vivaldi concertos to choose from, how do you know where to start? When one of those recordings has not a single concerto on it that you have knowingly heard before, how can you guess its worth? Well, if you see the words Gli Incogniti on it, that’s a pretty good sign; and if next to them there is also the name Giuliano Carmignola, that ought to be a clincher. Assuming you already like Vivaldi, there is perhaps not much more that needs to be said, but that would be to deprive me of my chance to enthuse. Amandine Beyer’s orchestra has impressed many with its dynamic performances of Baroque string repertoire, revealing a particular aptitude for identifying the contours of Vivaldi’s music and communicating its heady power to entrance. Their recent ‘Il teatro alla modo’ disc of rarely heard solo violin concertos (Harmonia Mundi, 12/15) was an ear-opener, and the ability it showed to expose the music’s inner dialogues finds further expression in this new disc of double concertos, with Carmignola as guest soloist. 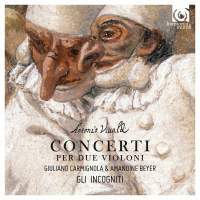 These are performances that burst with life, and right from the unaccompanied sparring between the soloists at the beginning of the first track (RV507) there is not a dull moment: the echo games in the finale of RV505 are brilliantly realised, no two of them quite the same, and even the solo-less ‘ripieno concerto’, RV127, included in the programme is somehow made urgently expressive. The tone of soloists and orchestra alike is rich and vital, and the recording has the right mix of clarity and bloom. Carmignola also recorded six totally different Vivaldi double concertos with Viktoria Mullova and the Venice Baroque Orchestra (Archiv, 11/08); but, though that too is exciting, there is less warmth than here. Beyer contributes a charming note in praise of Vivaldi and of the experience of being caught up in his music ‘like a drop of water tossed by the raging current’. Yes, Vivaldi is a force of nature, but it takes humanity to set it loose.